Alex: My normal travel dilemma comes up again. Is the hassle of flying with a S&S (fits in a big heavy suitcase) bike worth the rewards? 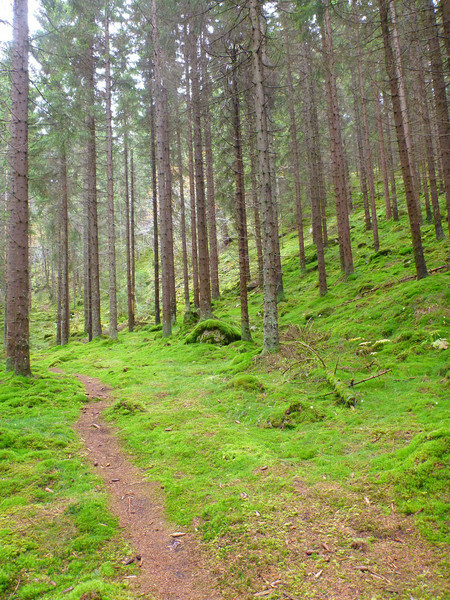 Leaning towards yes since Oslo is surrounded by awesome forest and I have a couple of days free. Joby: EVERY time I hauled my travel bike along on a trip I was super glad I did. I think it’s always worth the trouble. That did it, since I’ve always found bringing a bike to be the right choice. I was going to bring a bike. I decided to bring my folding bike (with small wheels) because it’s easier to pack and deal with in airports and on trains. My full size bikes are nicer to ride in the woods, but for a single day of riding that wasn’t worth the tradeoff. 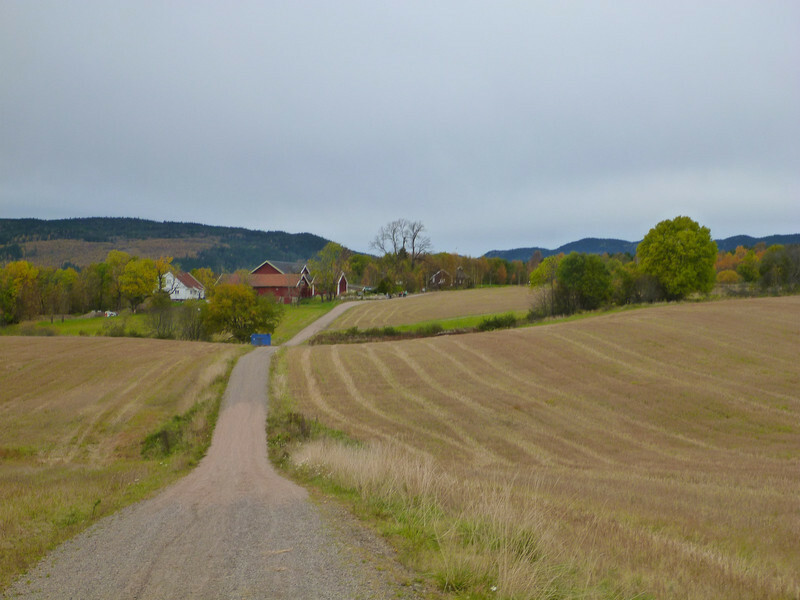 The awesome thing about Oslo is that there really aren’t suburbs. The city is about the same population as Seattle, but with double or more of the density. No suburbs and high density means that the woods are a short distance from downtown. In a 30 minute bike ride from the my hotel I could be out in the woods. I slept in late and left the hotel with my bike around 11:30. I followed a pretty small river out of town because the internet made it sound like there was a bike trail alongside. There was, but it was more of a walking trail (it had stairs) and frequently disappeared. However it was good enough to link me into the biking network and signage. 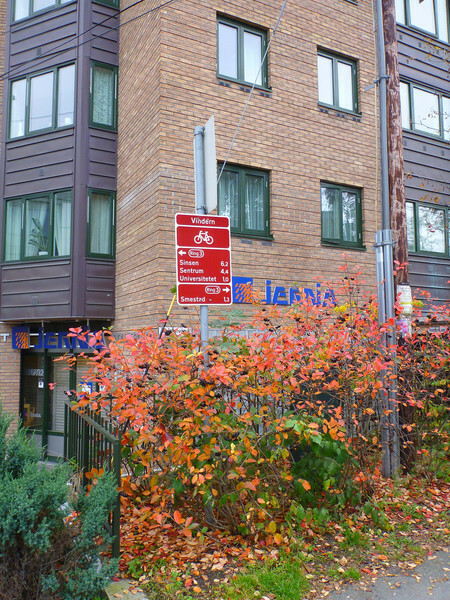 Oslo’s bike infrastructure looks a lot like many US cities and consists of bike lanes, some trails, and signs that help you get from place to place. Once I figured out which signs to follow it was easy to get out of town. When I made it out to the woods I just took the first trail that I saw. At first this was okay, but then I ended up on a narrow hiking trail with some big drops that weren’t suitable for my bike’s tiny 16″ wheels. 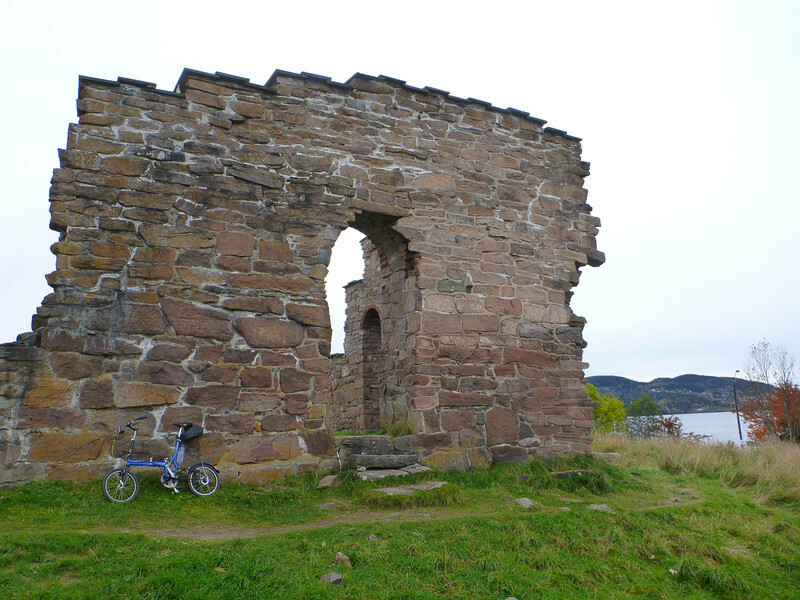 It was still really enjoyable to hike on, and the folding bike is easy to carry. 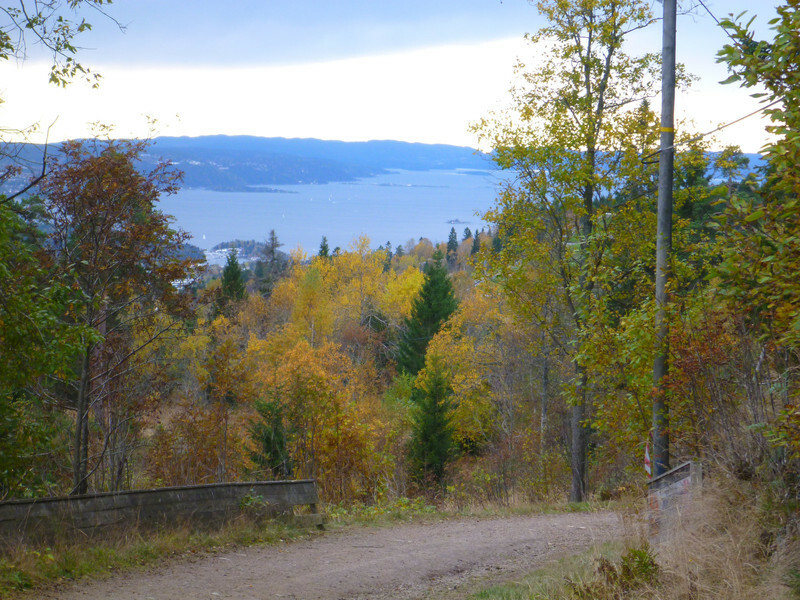 I hiked with the bike for about 1.5 hours until I came across a ski jump and watched kids in a ski jump competition. 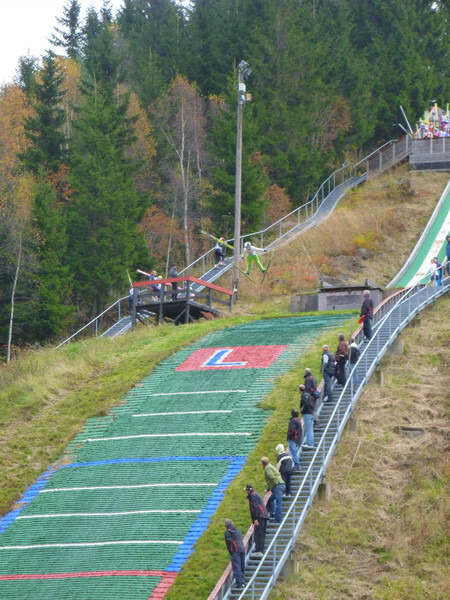 It’s October, so there isn’t any snow yet, and they were jumping onto something that looked like astroturf. From the ski jump I figured out that it was better to ride on what my GPS indicated were “lit trails”. These were cross country ski trails that had lights on in the winter, and the base was a hard packed gravel that was fine on my 16″ wheels. They also had more pedestrians, but it was nice to see how active the Oslo natives are. The woods felt alive, but it was also easy to have stretches where I didn’t see anyone. 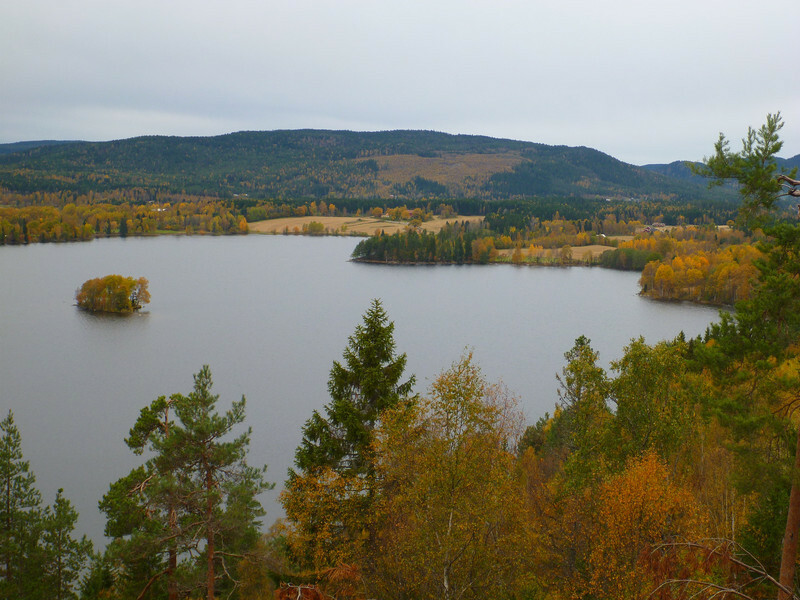 I really enjoyed going around a large lake which was surrounded with farms and trees that were changing colors. It was just stunning. I was also getting hungry at this time and I realized that I should find food. At one junction a good map showed all of the intersections with food. 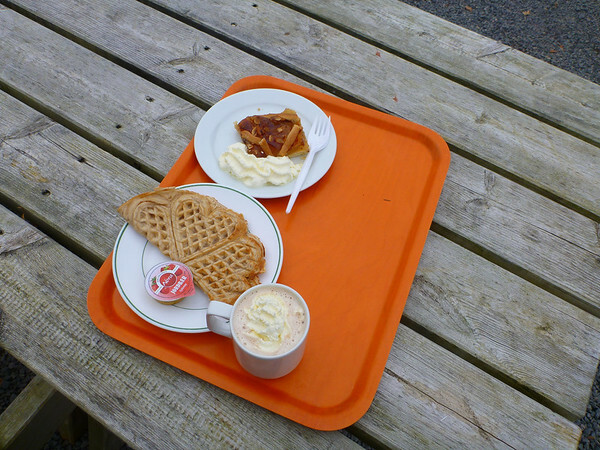 30 minutes of riding uphill and I was at a mountaintop cafe where I got a waffle, some apple cake, and hot chocolate. Good calories for a day in the woods. As I was hanging out at lunch the sky got a little darker, the air a bit cooler, and the wind picked up. I wasn’t too well prepared for rain, so at this point I wanted to head back towards the city. I followed the trail signs for a transit station name that I recognized and rode past 3 more beautiful little lakes on the way. 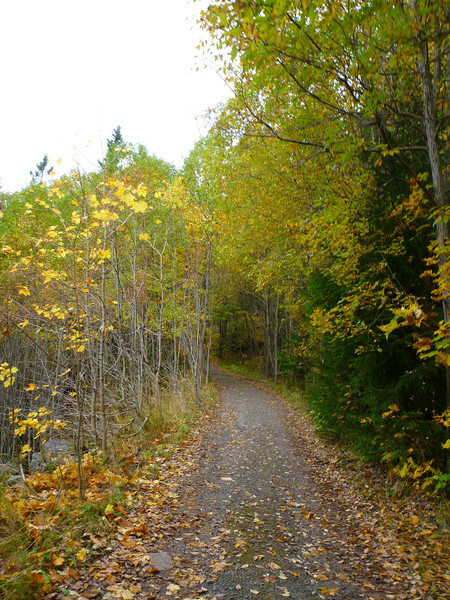 When I got to the transit station the gravel trails ended and the pavement began. I rolled downhill following the bike signs for “Sentrum” and ended up back in the urban core where my hotel is located. My GPS says that I biked around 30 miles or 50km. I just know that I spent left my hotel a little before noon and got back a little before 5. During most of the time in between I was lost in the woods and loving it. 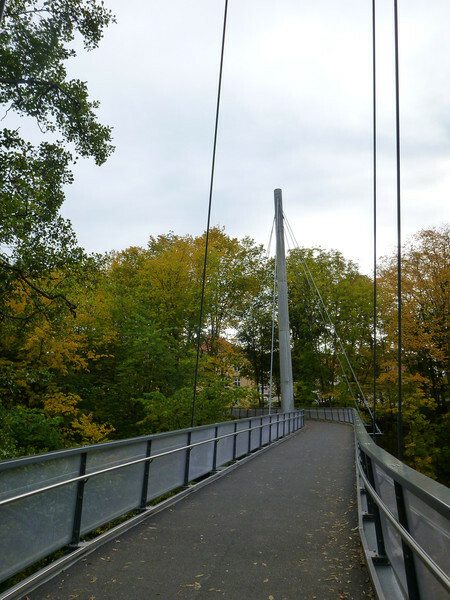 Oslo looks like a great place to explore by bike. Thanks for sharing your pictures! That’’s awesome! The scenery looks like North Carolina. I regrettably sold my tikit a while ago with the intentions to get a full sized mountain bike, but that never materialized. When I had the tikit, my coworkers wondered why I would go through the hassle to bring it along. One can experience so much more by bike when travelling – its hard to describe the feeling. Beautiful pictures. Sounds like a great day trip. Also, glad to see some updates on the site. Great story, Alex!!!! Thanks for the lovely oictures (but bring back a waffle or two next time). Our daughter will be studying in Oslo this fall. We plan to visit and are considering taking our s&s coupled tandem with us. Do you think it would be worth the trouble or could we more easily rent a bike there instead. The photos are very tempting. How much time do you have there? It’’s a beautiful area and if you have the time I think there would be some enjoyable riding. If you”ll only be riding for a day or two then I”d say rent or bring something easier to travel with. I”ve not rented a bike there though, and don”t know what the costs are (Oslo is generally quite expensive). 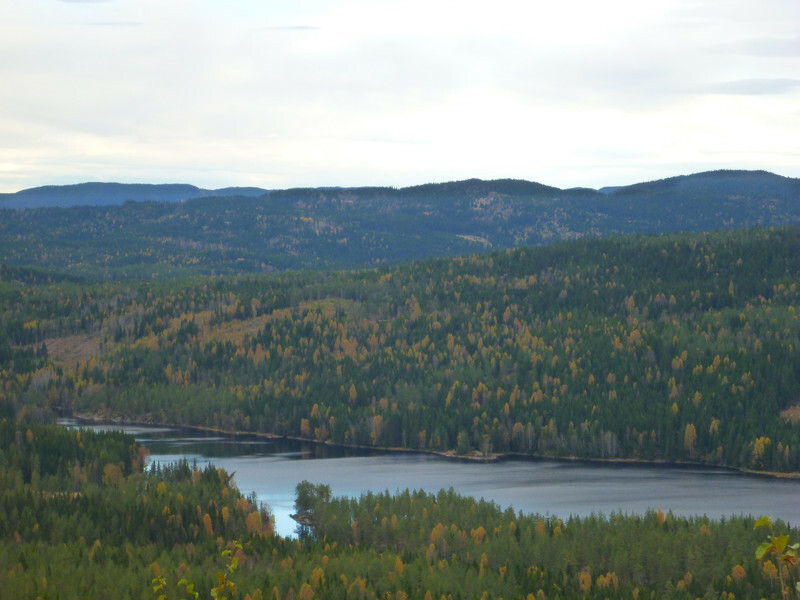 The hiking in the Nordmarka is quite good and very accessible. 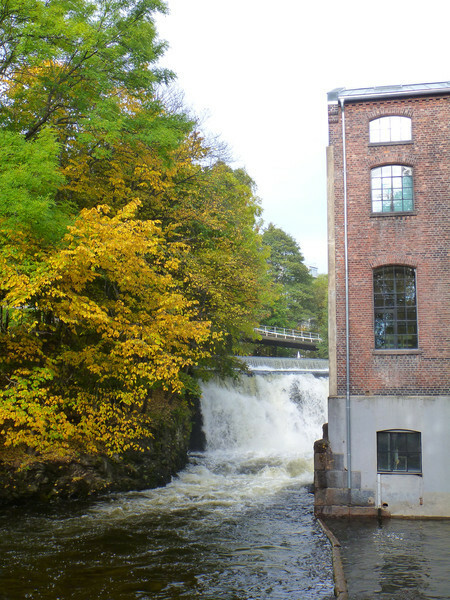 I was in Oslo in Feb and brought my wife and we did some nice walks from the subway instead of bringing bikes. Thanks for the info. I hope we can stay for 2 weeks, but we will have to look at time and costs. There is a direct flight from Orlando( we live in FL) so that will make taking the tandem easier to manage.